The Canadienne breed dominated until the beginning of the 19th century. 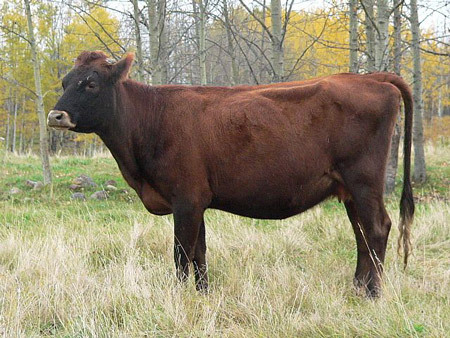 Later, the breed was threatened by the introduction of larger sized British stock, before being taken in hand in 1883 by a small group of concerned breeders who formed the Canadienne Cattle Breeders Association. The Canadienne breed is still mainly found in the province of Quebec. The Canadienne is recognized for her hardiness and adaptability to inhospitable soils and climates. Born pale, the coat becomes black, brown, tawny or reddish-brown with a paler muzzle, side, and udder or scrotum.. Cows weigh 1000 -1100 pounds, are long-lived and have a docile temperament. The meat tends to be lean, and the light bone results in a high dressing percentage. Their milk is also in demand for cheese production.